Conveniently located and professionally staffed, our physical therapy offices, fitness center, balance center and specialized injury prevention programs for performing artists reflect state of the art technology and commitment to your needs. Ellen Bodner's Facilities are widely recognized as the go-to centers for living a full, fit and confident life. 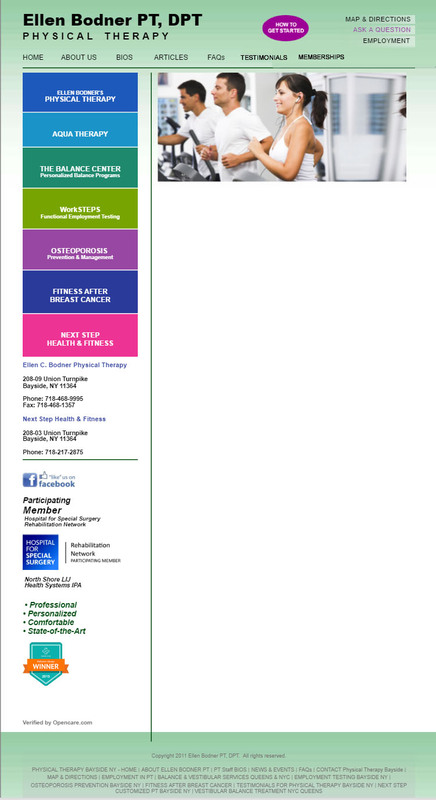 Whether you're a professional athlete who wants to optimize your athletic performance, a post surgical or post injury patient who is eager to return to work, or a teenager, young mother or senior citizen who needs to upgrade your level of fitness, Ellen Bodner's team can design a program that will help you achieve your goals--effectively and safely.